Can you benefit from the best negotiating skills? Are you up to date on negotiating techniques? Are you good at sales negotiating? In this insightful program, you will learn to recognize negotiation tactics used against you and learn the best ideas from David Palmer’s popular negotiation seminar. A favorable price is determined by three factors: who knows what, when they know it, and what it means. It is not determined by clever words, logic, or arguments. You must discover and pay close attention to what is going on in the other person’s head . . . as well as what’s going on in your head. People equate price with dollars, costs are a lot more complicated. Price negotiations are not determined by the strength of one’s arguments, but by research and a well prepared sequence of probing questions. People classify information by comparison. Therefore, create the frame of reference you want them to use. Let them see, understand, and appreciate all of the value inside your un-bundled price. 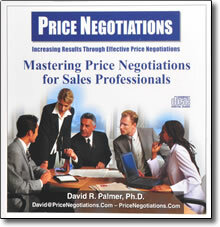 Prices are set by negotiation; they can be changed by negotiation.